Ben Duckett laid down a marker at the start of the 2019 first class season with a sparkling century against Cambridge MCCU at Fenner’s. The 24 year old, who joined Notts from Northants towards the end of last season, scored 216 as the county piled on the runs in idyllic conditions. Duckett scored his runs at a brisk pace, reaching his double-hundred, the third of his career, from 168 deliveries in early afternoon. In terms of balls faced it is the quickest 200 ever scored by a Notts batsman. His partnership with Ben Slater materialised 325 for the opening wicket, with the former Derbyshire man also reaching three figures. “There’s no better way for me to start the summer,” said Duckett. “Especially to score runs with Slats, because we haven’t batted together all that much. “It’s the first time we’ve opened together and for the partnership it’s been good to see how each other ticks. “I think we worked well together. We’re obviously very different players. 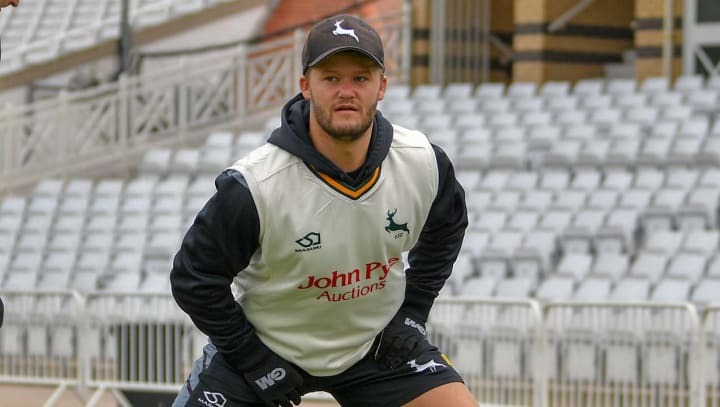 Duckett made the move from Northants last September and played the final three matches of 2018 for his new county, making 80 on debut against Yorkshire. His winter cricket included spells in the Abu Dhabi and Mzansi T20 tournaments, as well as further representative matches for England Lions, where he opened the batting in a team containing his county captain. “I think the plan was for me to bat three this year but Mull (Steven Mullaney) saw me opening in the winter and we spoke about me doing it. The hard-hitting batsman reveals he’s enjoying settling back into county duty. “I’ve been away for a lot of the winter, so it still all feels very new and very exciting. “It was great to play a few games at the end of last year, so it gave me a chance to get to know all the lads and see what they’re like on and off the pitch. I’m just buzzing to get started with them now. “It was nice to get runs whilst I was away with the Lions, but I’ll be facing different conditions here. “It’s obviously going to nip around a little more than it did in India, but it was nice to go away and play in different places. “There were six of us all away together with the Lions this winter and it’s so exciting for Notts having these young players. “We know we’ve got senior players here but if the young group can perform it all looks very exciting. “I think we’ve got good depth to the squad and that’s going to be so vital if we’re going to win something this year. “There are bound to be some injuries and times when some players miss out, but we’ve got people who can fill in for every single position, so it’s all very exciting. “At the back end of last year we didn’t get a win, so it’s going to be so important to start well. We played Yorkshire out in Potch (pre-season tour), so we know a little about them and what side they’ll have. With 216 first-class runs already banked, the Farnborough-born opener is already well on the way to his first target. Duckett’s double hundred also hits the record books as the third fastest in English domestic cricket and the fourth fastest by any opener.